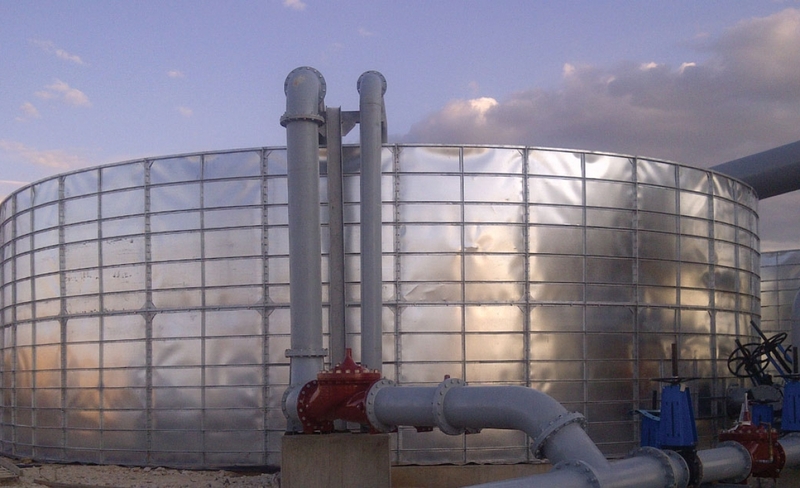 Hydrex® panel reservoirs offer long-term water storage solutions. The panel reservoir is constructed using steel bolt-together type frames that are cladded with galvanised sheets. Panel reservoirs have the highest structural weight ratio when compared to other reservoirs, thus giving the reservoir the rigidity to be either free standing or to be fitted with a trussed and cladded tarpaulin or metal roof. These reservoir are generally only fitted with 750 and 1000 Microns PVC linbers or 1.5mm HDPE membranes, which give them exceptional durability. We also provide chemically resistant speciality liners for the storage of abrasive liquids and certain petro chemicals. These reservoirs are available in various heights and configurations with storage capacities ranging from 2000 litres through to 4 Million litres. The 4.00 meter panel reservoir range is used for high volume water storage, often associated with high flow rates.